Real Food Daily: March is National Nutrition Month! With the first blush of spring already here, I’m super excited about all the fabulous summer fruits and vegetables on the way! 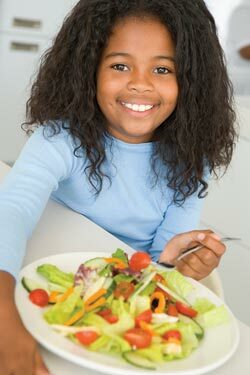 Just in time for National Nutrition Month; the theme is "Eat Right with Color." This month join me in making healthy choices by incorporating a colorful variety of fruits, vegetables, whole grains, lean proteins and dairy into your meals every day. This doesn’t require a major lifestyle change; simply start by making small improvements that, over time, add up to significant health benefits. National Nutrition Month is an annual campaign sponsored by the American Dietetic Association to promote nutrition awareness and education. The theme changes each year, but it always focuses on the importance of making informed food choices and developing sound eating and physical activity habits. Well, let’s get started with color. This year's theme, "Eat Right with Color," provides an easy way to focus on improving eating habits. Adding a splash of colorful seasonal foods provides your body with a rainbow of powerful nutrients! So, just think variety and color and you have a winning combination. One of my favorites is a tropical rainbow fruit salad; oranges, pink grapefruit, mango, papaya, kiwi, bananas, and grapes. Or how about a Greek inspired salad: field greens, tomatoes, red onion, chick peas, black olives and artichoke hearts. This is also a great time of year to support “local.” On Saturday mornings, I shop at a farmers market near my home; I buy raw milk cheeses, along with fruits and vegetables from growers nearby. The offerings are fresh picked and in season. Just as important, I have the satisfaction of supporting local growers and helping the environment. The increase in farmers markets is helping consumers all over the country discover the flavors of local produce. Along with sales at roadside stands, family farmers sell products through cooperatives and in some chain supermarkets.